Folder extension views are portal pages that can present unique views of folder extension data. To create a new folder extension view in the Portal, navigate to a Designer Folder, Folder Behavior Actions > [Your Folder Extension]	, and select the Create Page/Dashboard	button. 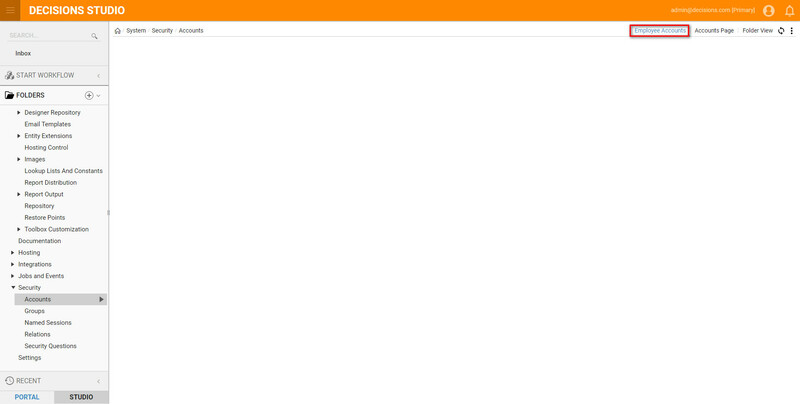 In the example, create a new view of our folder called "Alternate View". This view will include a report of the entities contained within the folder, and an Image Viewer component that can be used to define a single image within the folder. The page needs to know the context of the data structure, create a folder extension type, in which the page will be created. 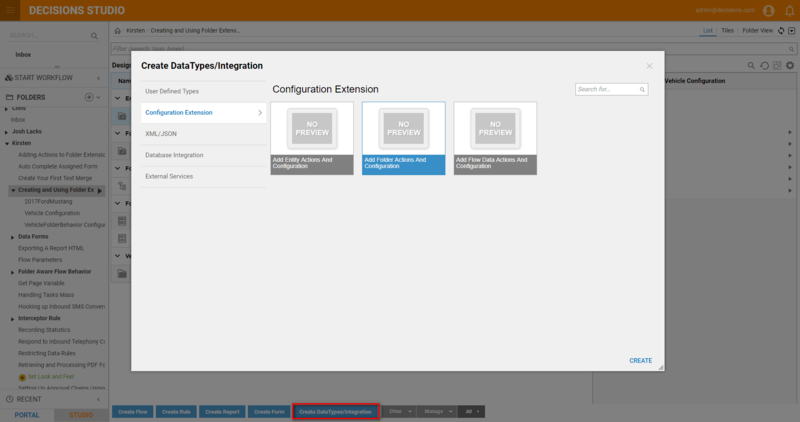 Begin in the portal by navigating to a Designer Projects folder, and select **Datatypes/Integrations > Configuration Extension > Add Folder Actions and Configuration	. Note:	It is possible to create multiple folder action folders, and in some cases, recommended. Reasons to create more than one actions folder are to (1) better organize by functionality, and (2) apply different security (thus restricting users to see only folder actions relevant to them) (Figure 1). In the Type Name	field, select the Accounts Folder [DecisionsFramework.ServiceLayer.Utilities.AccountsFolder] option select Save. Notice a folder under the Designer Folder is automatically generated. This is where the page will live. 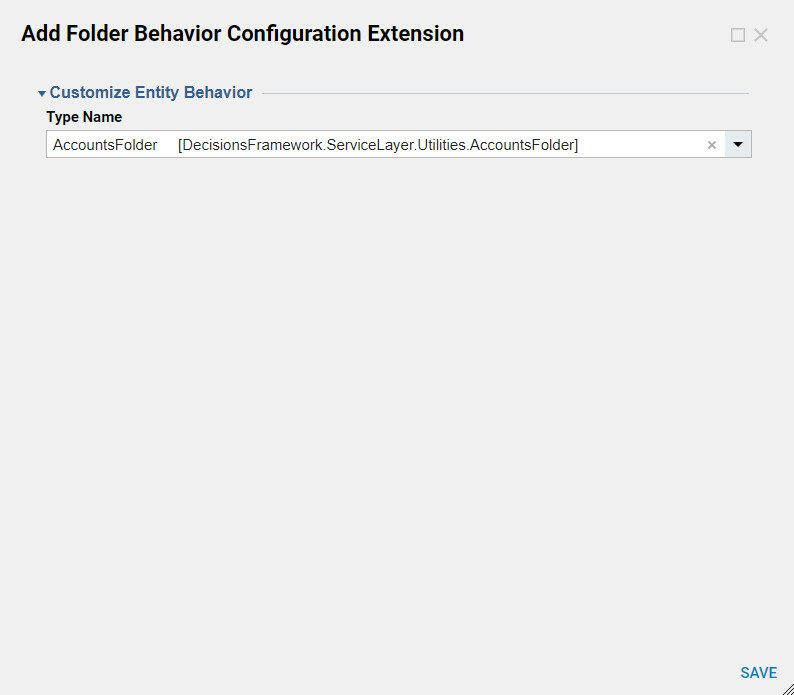 Portal pages and flows that are created in this folder will be used as page templates and actions for instances of the folder extension. Select this folder. Select the Create Report/Page	button, then select Create Page/Dashboard	. 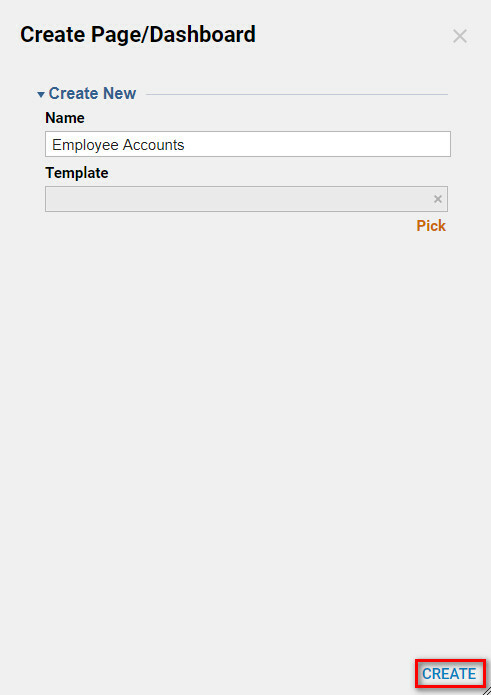 In the resulting New Page	pop-up, we will call our page "Employee Accounts" and select Create	to open it in the Page Designer. After a Page/Dashboard	has been created on the Configuration Folder, the newly created Dashboard view can be found in accounts. Start by Navigating to Systems>Security>Accounts. The Dashboard view that you created for accounts will now show in the Decisions accounts folder. Customize the Dashboard page to show all the desired data.